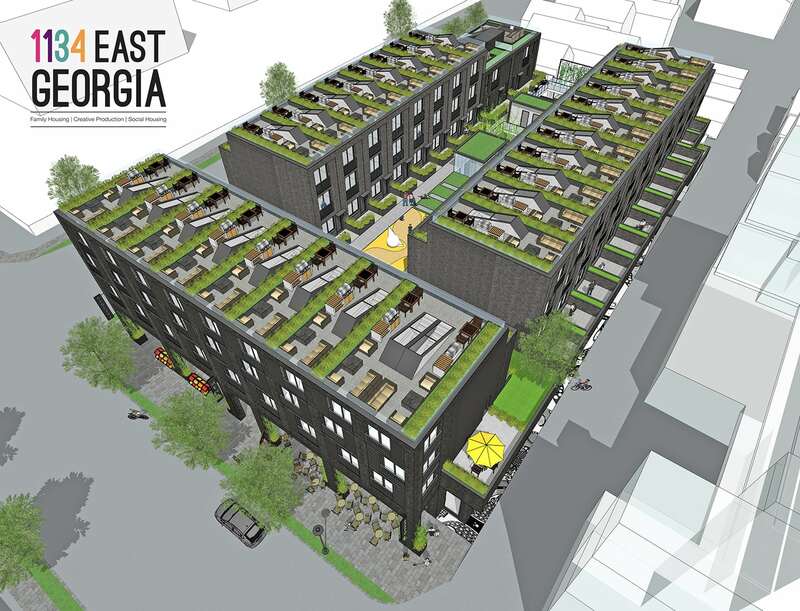 EKISTICS has applied for rezoning of a 4-storey mixed-use family housing and ground-orientated creative production building at 1134 East Georgia Street in Kiwassa East, Vancouver. Located at the southeast corner of the intersection of Glen Drive and East Georgia Street, just across from Admiral Seymour Elementary School – our project is an exciting addition to the diverse East Vancouver neighbourhood of Kiwassa East, under the Downtown Eastside Plan (DTES). 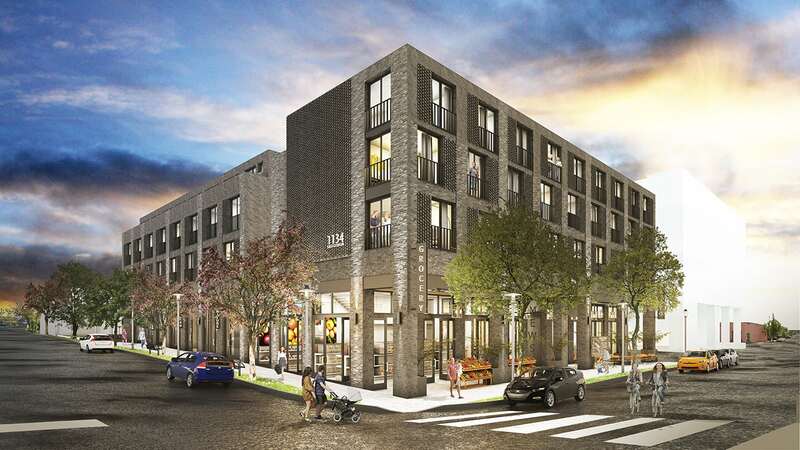 Replacing a single-story commercial / industrial building, this 4-story mixed-use building will add significant Social and Family housing, as well as local creative and production uses at-grade providing a truly integrated mixed-use community within the project. The building’s character is varied in texture and material, blending the strong historic industrial character of the neighbourhood with a contemporary approach to urban living. Our four-storey proposal calls for 37 homes, with 20% of the units set aside for social housing operated by the ANHART Foundation. The unit mix is comprised of two studio units, four one-bedroom units, one two-bedroom unit, and 30 three-bedroom units, making the new housing project largely family-oriented. Residents will have access to 5,400 sq. ft. of outdoor amenity space in the internal courtyard and mezzanine level. Those who live on the top floor will even have their own private rooftop patios with green roofs and operable skylights. There will also be 16,100 sq. ft. of “creative commercial” space, which will be located on the ground level with much of the space facing an internal mews and internal corridor. The ceiling of this corridor and other exterior overhangs on the ground level are enhanced as a canvas for public art. Open air corridors with skylights bisect the block, providing a pedestrian scaled ‘street’ at grade within the creative commercial community of the building. 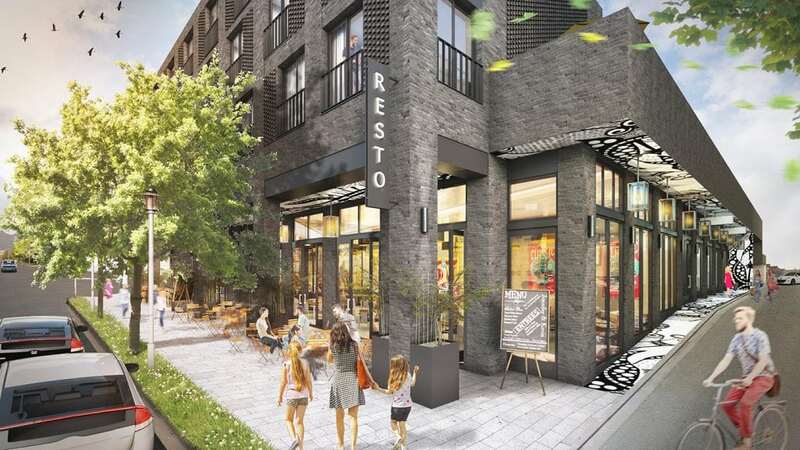 The goal is to bring a sense of the city grid into the building at a pedestrian scale encouraging an integrated, more intimate connection with the site rather than a typical perimeter block commercial condition. These connections bring the neighbourhood into the activity of the building during the day. The spaces provide an open, semi-public zone within the building for the outside community and the people working within the building to gather and interact. 1134 East Georgia has a total floor area of 67,000 sq. ft. on its 25,300-sq-ft development site, giving it a floor space ratio density of 2.5 times the size of its lot. It falls under the Downtown Eastside Community Plan.